Semarang│ Unimus (30/8/2018) Universitas Muhammadiyah Semarang (Unimus) send three students to join the upcoming 31st Student Science Week hold in Universitas Negeri Yogyakarta (UNY). Those are the representative from Faculty of Mathematics and Natural Science (FMIPA) Unimus would compete with 1.520 students from 136 Higher Education Institution in Indonesia on 30 August to 1 September 2018. 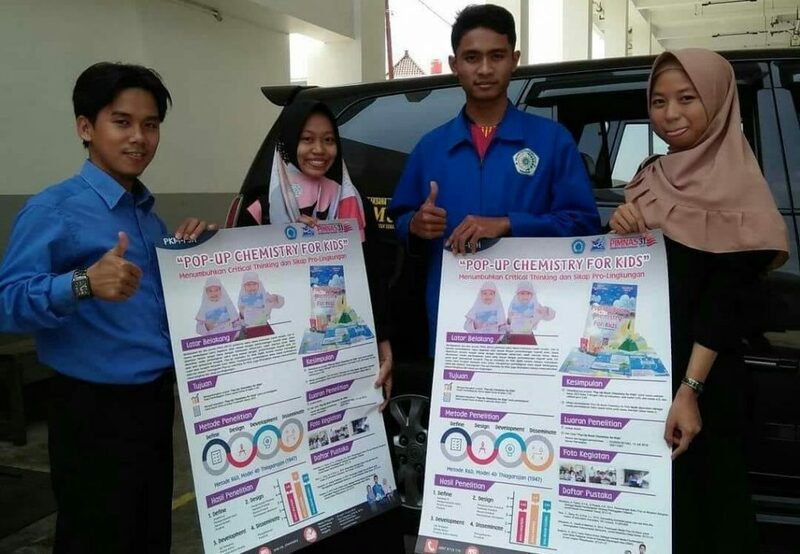 Those outstanding students are Johara Aulia Zaeni (Chemistry Education of Class 2014), Aisyiyah Dinnur Utami (Chemistry Education of Class 2016) and Luqmanul Hakim (Mathematics Education of Class 2014). 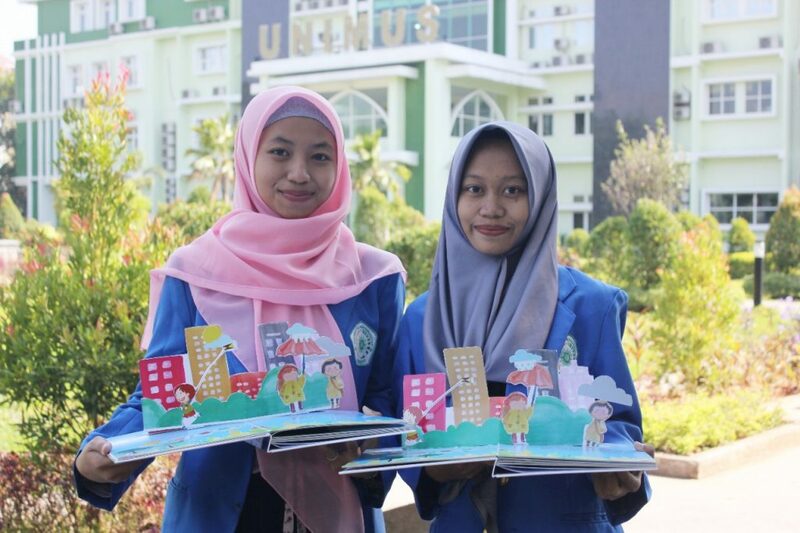 They are going to present their innovation entitled “Pop-Up Chemistry for Kids Menumbuhkan Critical Thinking & Pro Lingkungan“. Johara stated that this project is new innovation which aims at learning media equipment for Elementary students to stimulate their critical thinking and own high awareness of the environment. “We are trying our best to give the best. Pop-up concept is attractive for children because it gives them experience to watch picture that pop on the surface, and it is quite interesting”, Johara added. Eko Yuliyanto, M.Si as the facilitator is going to guide the students and Fitria Fatichatul Hidayah, M.Pd as the Head of Chemistry Education Study Program in Unimus expressed “We are very grateful for our students’ achievement, because we know that not every student has the opportunity to join this prestigious national events. Their wonderful journey in accomplishing this is not easy. They have to pass through several procedures such as Dikti funding selection, report presentation, deliver progress report, monitoring and evaluating process, uploading final report. It is definitely result of patience, hardworking that teach us how to build solid team work, to perform great time management, and to realise the output of research. Fitria also stated that lecturer as facilitator has played his role to guide, facilitate, and support our students. “We also do our best to support our student by preparing several things like mental, product, poster, outcome, and performance. We hope that they are able to do their best and be the champion. Vice Rector III of Unimus, Samsudi Raharjo, M.M., M.T. asserted that so far students’ interest in writing/creating qualified PKM is getting higher. It is indicated that in 2018 there are at least 23 students’ PKM proposals of Unimus granted funding selection from The Ministry of Research, Technology and Higher Education (Kemenristekdikti). “Hopefully more students would eligible for Pimnas.” Ended WR III.